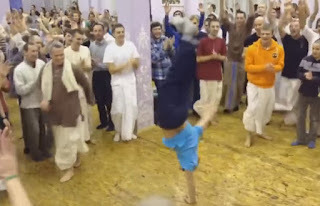 Video: "B-Boying" Hare Krishnas in Moscow! ~ The Toronto Hare Krishna Temple! Video: "B-Boying" Hare Krishnas in Moscow! While dancing during praying to god is pretty popular in India, especially during jagrans and in temples, what is not is b-boying! One such religious gathering at a Radha Krishna temple turned rather entertaining when some ISKCON monks took to b-boying during a bhajan recitation. If you have ever been to a Hare Rama Hare Krishna Temple, you’d know the atmosphere there brims with infectious energy and tempo, and people are encouraged to shed their inhibitions and surrender themselves to god. Dancing and swaying is quite common here but b-boying just takes it to another level. Well, dance has no religion. Watch them perform their killing breakdance moves to the music of bells and chants of Hare Rama Hare Krishna in this video! The B-Boying boys!